FAQ: Can I Upgrade and retain all my Users, Groups and Settings? Yes!! 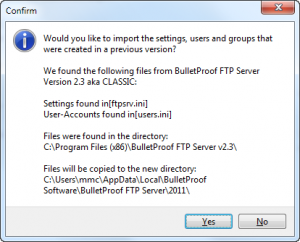 You can certainly upgrade and retain all of the Users, Groups and Settings that you currently have defined in any version of BulletProof FTP Server. In designing the latest version of BulletProof FTP Server, it has been a paramount concern that upgrades from a previous versions are supported 100% for our previous customers. This includes customers running versions: v2.21, v2.3, v2.3.1.26, v2.4, v2.5, v2010, v2011, any version! 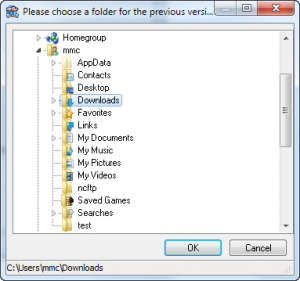 FAQ: Where does BPFTP Server store the Users, Groups and Settings? 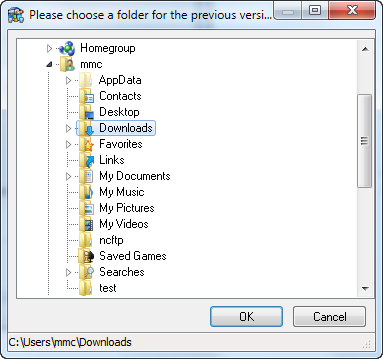 NOTE: The original files will not be harmed in anyway and you can even run the previous and current version of the software on the same computer without them conflicting. 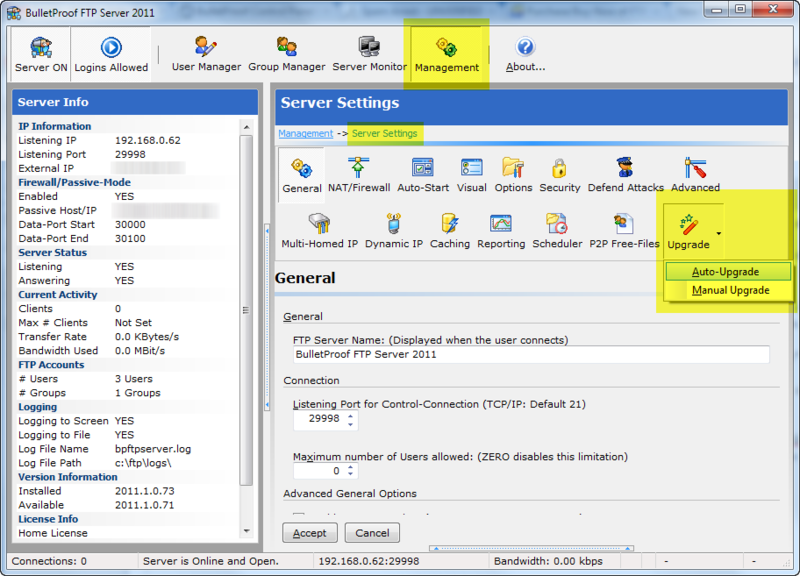 Same Computer: Migrating the Users, Groups and Settings from a previous version is very simple and automatically provided when the latest version of BulletProof FTP Server is installed and started for the first time on a machine that currently runs a previous version. New Computer: If you are creating a new Windows machine to run the latest version of BulletProof FTP Server; and would like to migrate the Users, Groups and Settings from this previous machine, you would simply copy the *.INI files to location that the new Windows machine can access (USB drive, network share, emailed attachment, etc). Previous Previous post: FAQ: Where does BPFTP Server store the Users, Groups and Settings?